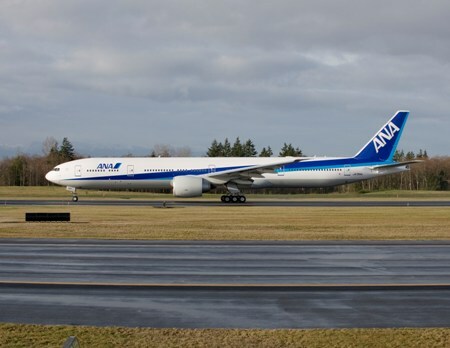 SEATTLE, July 31, 2013 /PRNewswire/ -- Boeing (NYSE: BA) and All Nippon Airways (ANA) announced that ANA has ordered three additional 777-300ER (extended range) airplanes. The order, valued at approximately $945 million at current list prices, will increase the total number of 777s in ANA's fleet to 57 airplanes once delivered. "The addition of three new Boeing 777-300ER aircraft will further strengthen ANA Group's long-haul network," said Shinichiro Ito, President and CEO of ANA Holdings Inc. "The acquisition of our new 777-300ER airplanes will allow us to capitalize on the expansion of airport slots in the Tokyo area." ANA, the launch customer and Boeing's largest commercial airline customer for the 787 Dreamliner, is strategically expanding its aircraft fleet with new business opportunities arising in the rapidly growing Asia Pacific market. "We are honored to have ANA validate the economics and reliability of the 777 once again," said Ray Conner, President and CEO of Boeing Commercial Airplanes. "The 777-300ER has proved to be a perfect fit for ANA's network expansion and will provide added flexibility and strategic advantage as slots continue to open up in the market." The Boeing 777 is the world's most successful twin-engine, long-haul airplane. The 777-300ER is equipped with the world's most powerful GE90-115B commercial jet engine, and can seat up to 386 passengers in a three-class configuration with a maximum range of 7,930 nautical miles (14,685 km). With today's order, Boeing has accumulated 1,460 orders for 777s from 66 global customers to date.